At the very end of WWII the Soviets paraded 52 brand new tanks at the Victory Parade in Berlin. 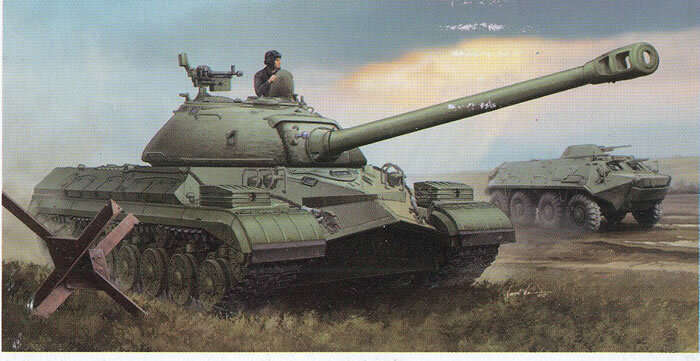 These turned out to be the very first IS-3 heavy tanks and they impressed and scared the West. But the IS-3 was a dog - subject to sudden breakages and failures, and a cramped and miserable tank to serve in for Soviet tankers. After several different options were tried, an improved tank, dubbed the IS-5, was proposed. During the late 1940s progress continued on this tank, and after some false starts an improved version was offered first as the IS-5 and after considerable internal redesign as the IS-8. This tank managed to pass all tests and was accepted for service, but between the time it was accepted and the first tanks rolled out in 1953 Stalin died, so the new tank was redesignated T-10. The T-10 was essentially an “IS-3 2.0" with many corrections to that design but also a lot of pricey changes and upgrades. But it was still nothing the Red Army was particularly thrilled about - as it was a bigger and worse heavier IS-3 at the end of the day - and as a result between 1953 when it entered production and 1957 when the T-10A replaced it in production only 205 tanks were built. While it was a perfected IS-3, it was...a perfected IS-3. It could sustain 42 kph on highways, but even there it only had a range of about 230 kilometers (whereas a T-54 had a range of 500-700 kilometers). Over 45 years ago Tamiya released kits of what it called the “T-10 JS-III” tanks but they were clearly based on the T-10B and T-10M tanks. At least four different versions of this tank were kitted with different parts and components in each one (I have one of each and found that out the hard way) but none of them really represented an accurate T-10 of any sort. Some resin kits from companies like Navigator and Brigadyr in Russia have come out over the years but now Trumpeter is the first to offer a kit of the initial version of the tank, the T-10. This kit is relatively simple by modern standards and uses “stick them together” single link tracks, one set of links for the left track and one for the right. As with their T-10M kit, it starts out with the lower hull (as do most tanks) and all of the suspension components are separate items. Six of the road wheel axles are fitted with shock absorbers and fluid reservoirs which is correct. Note that this kit actually uses the wheels from Trumpeter’s IS-4M kit. The next steps cover the turret which in its case is much simpler than that of the T-10M. The amazing KPVT antiaircraft machine gun is replaced here with the correct but more mundane 12.7mm DShKM and the commander’s cupola is also much simpler. Unlike the M with its fancy mount and gun assembly this has a simple swing-away cupola and mount for the AAMG. The gun does come with the option of either a two piece styrene barrel tube or a turned aluminum one. These tanks did not have a canvas cover over the mantelet so that is not a problem with this tank. Construction of the hull is very straightforward and all of the weld lines are present, albeit some may wish to enhance them. The “cages” over the headlights are nicely done and should be simple to assemble and install. PE fender flaps are provided for the mud flaps at each corner. Other minor details are missing but in most cases understandable. Apparently the early model T-10s did not have a “demand” system so the rear external fuel tanks (Y-21/22) are not “plumbed” into the tank. This tank is fitted with the grillwork over the top of the exhaust openings (the smaller outer grills on the engine deck with covers PE-C2). Others are not but the grid pattern inside them is quite different so the PE parts should be used. Technical advice and support was provided by Kirill Koksharkov from Chelyabinsk in the design and production of this kit. Only one finishing option is provided for a generic T-10 in protective green paint and no markings. No decals are included either. Overall, while a simple vehicle this is actually quite accurate and other than a lack of finishing options (as most of the photos are of test tanks there are not a lot of references out there!) it is a nice kit.